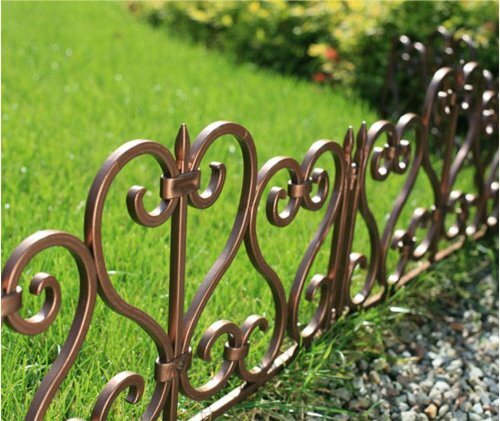 Metal edging varies tremendously, from low level wrought iron fences that appeal to both old and modern gardens, to metal border strips for the more contemporary look. The low level fences can easily be installed, usually requiring them to be spiked into the ground and help together with links. There are many different styles out there and we've covered the ones that we think provide a good selection. Metal edging can last a long time and can be easily taken up and re-painted if necessary. Or if you want to extend your border, they can be easily relocated. Look out your window and have a think about the colours of the plants you have in your garden. Now imagine the edging product against those plants before you decide to go ahead and purchase. This entry was posted in lawn edging guide - tips and tricks and tagged guidance, Metal Edging. Bookmark the permalink.